The Historical Museum & Art Gallery will be closed this Sunday for the Easter holiday. For those who celebrate this spring holiday, we hope you have a wonderful Easter weekend. We will reopen for our normal spring schedule hours on Sunday, April 27th from 1:00-4:00p.m. 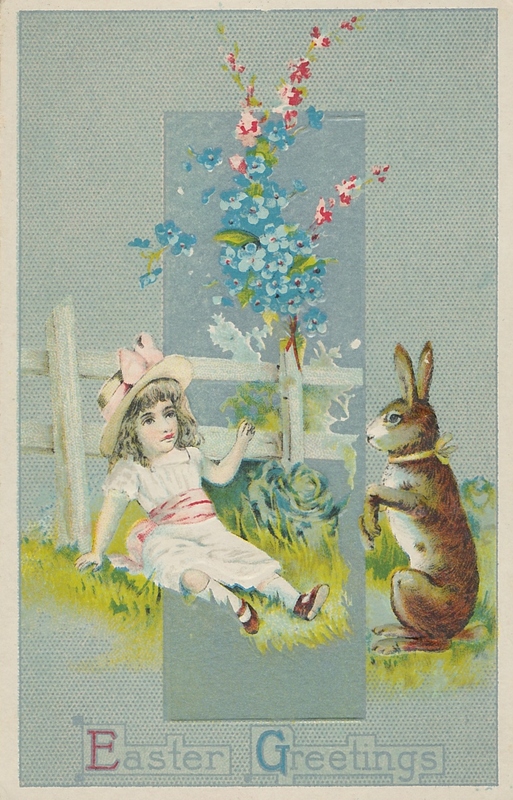 Easter Greetings Card, 1900s, from the Collection of the Historical Society. “10th Thursday A cloudy damp muddy day, I did my choars was at the office all day & evening came home about ____ & went to bed nearly sick. 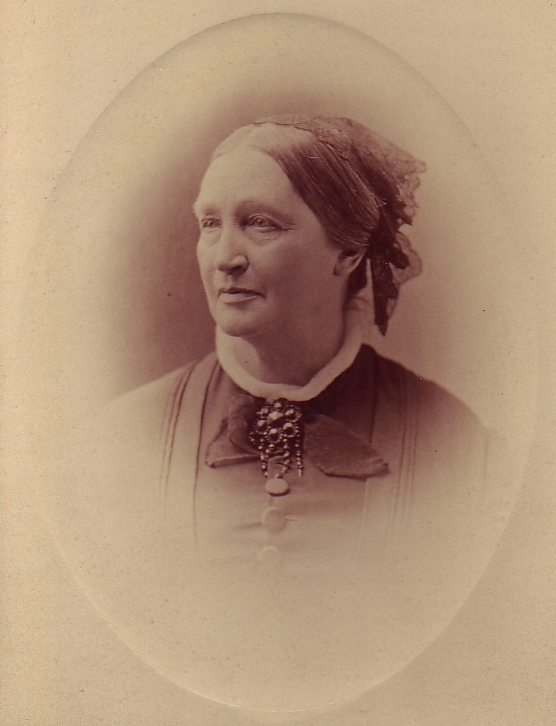 Mrs Potter went to Williamses & stayed all night & helped Williams people in their afflication. “11th Friday rather a cloudy damp misty forenoon more pleasant in afternoon I did my choars was at the office all day & evening came home between 8 & 9 & went to bed about 9 ½ sick nearly & had the blues, Mrs Potter got home about 2 oclock from Williamses & found George O Potter here he came in the stage at noon was sick & a most blinded with sore eyes, Samuel Williams was buried in the burying ground this afternoon, Elder Hanna preached the funeral sermon. “12th Saturday A cloudy damp muddy day snowed some during the day & snowed the ground white during the evening & froze, I did my choars was at the office all day & evening came home at 8 ½ by Hoyts & went to bed about 9 ½ nearly sick. “13th Sunday A cool & some cloudy morning but rather a pleasant day & thawed, I did my choars was round home a chaoring the most of the day, went to the office near night & came home by Hoyts & went to bed before 9 nearly sick, Beardsley & wife and several others were here to see George & wife, Colered Mary was here. “14th Monday rather fine cold weather for March & rough. I did my choars was at the office all day & evening came home about 8 ½ & went to bed about 9 ½ nearly sick. “15th Tuesday rather fine cold rough weather, I did my choars was at the office all day & evening came home about 8 ½ & went to bed about 9 ½ lonely & sick. 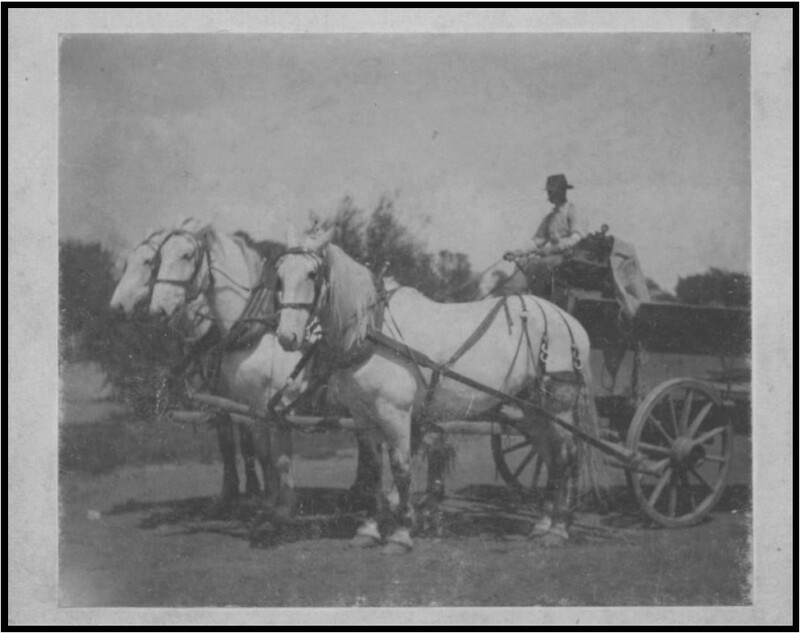 One of the many photographs in the Warrenville Historical Society’s collection, this historic image is of the Warrenville Grist Mill’s horses and driver, Ira Millet, taken around 1895. As Leone Schmidt noted in In and Around Historic Warrenville, in the early days of Warrenville “one’s livelihood depended on the turning of the gristmill’s wheel,” as early farmers relied on the power of the river to grind corn and grain. Ira Millet, once employed by the mill, was later hired by another important company, the Aurora, Elgin & Chicago Railway, which brought train service through the town, providing residents a new form of transportation for the first half of the 20th century. 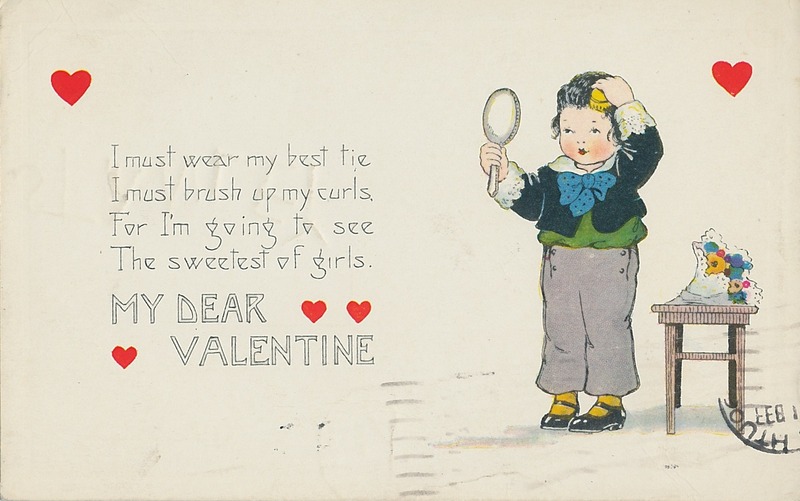 In honor of Valentine’s Day, please enjoy this 1920s card from when it cost just 1¢ to send your sweetheart a message. Valentine’s Day cards began gaining popularity in England at the end of the 18th century and the embossed paper lace greetings were in the United States within 50 years. Cards were the main item exchanged before the mid-20th century when gifts started being given. Joseph B. Munk was born on May 24, 1840. 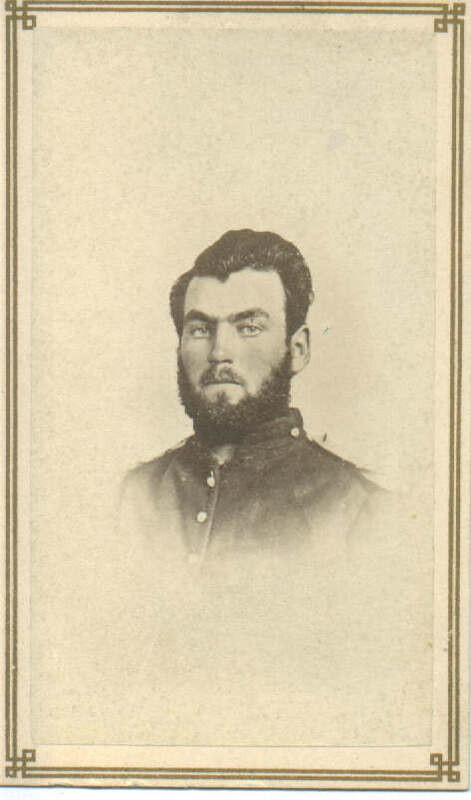 At the age of 21, he joined the 15th Cavalry Company H on September 23, 1861. Sadly, Joseph was one of 17 Warrenville men killed in the Civil War. He is buried in the Warrenville Cemetery. Join the Historical Society at the Warrenville Library this Sunday, January 27th at 2:00 p.m. for “1863 in 48 Minutes” to learn more about the brave men who left our community to fight in the Civil War. 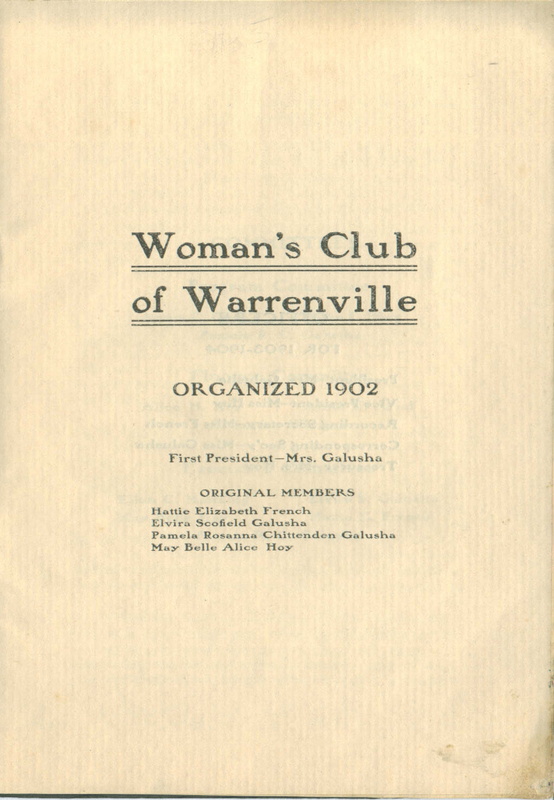 Please see our post on the program here https://warrenvillehistorical.wordpress.com/2013/01/10/1863-in-48-minutes/ to learn more. 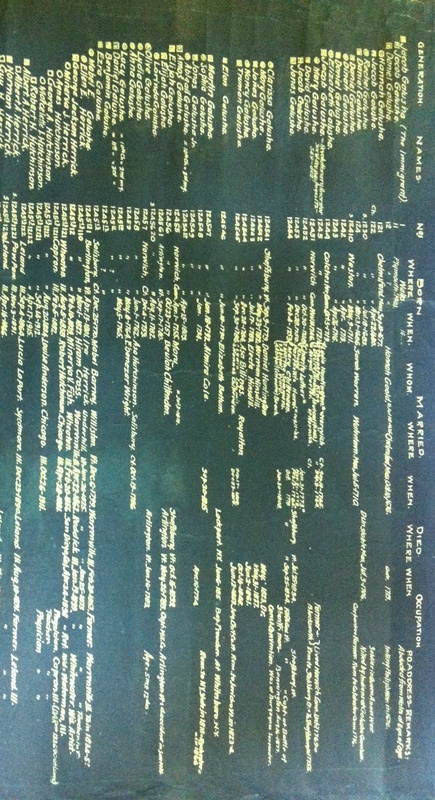 As our country marks the 200th Anniversary of the War of 1812, our July artifact of the month is a Galusha genealogical chart, that was produced by George Herrick in 1918. Ezra Galusha was an early settler in Warrenville and is the only War of 1812 veteran known to be buried in the Warrenville Cemetery. Ezra brought his family to Warrenville in 1834, following his son Jacob, who had traveled to Warrenville and claimed land on what is today Galusha Road in 1833. The Historical Museum will feature the Galusha family in an exhibit starting in September. April’s artifact of the month is a unique piece to say the least! This hair sculpture, in the form of a cross, memorializes members of the Warren family, Warrenville’s founders. The hair cross, which includes pieces of hair from 66 members of the family, was made by Marion Bird, the mother-in-law of Louisa Warren Bird, who was one of Colonel Julius Warren’s seven sisters. The sculpture was intricately crafted between 1839 and 1903. On December 30, 1903, Marion and her brother-in-law James McKee perished with at least 603 others in the Chicago Iroquois Theater Fire, the deadliest theater fire and the deadliest single-building fire in U.S. history. 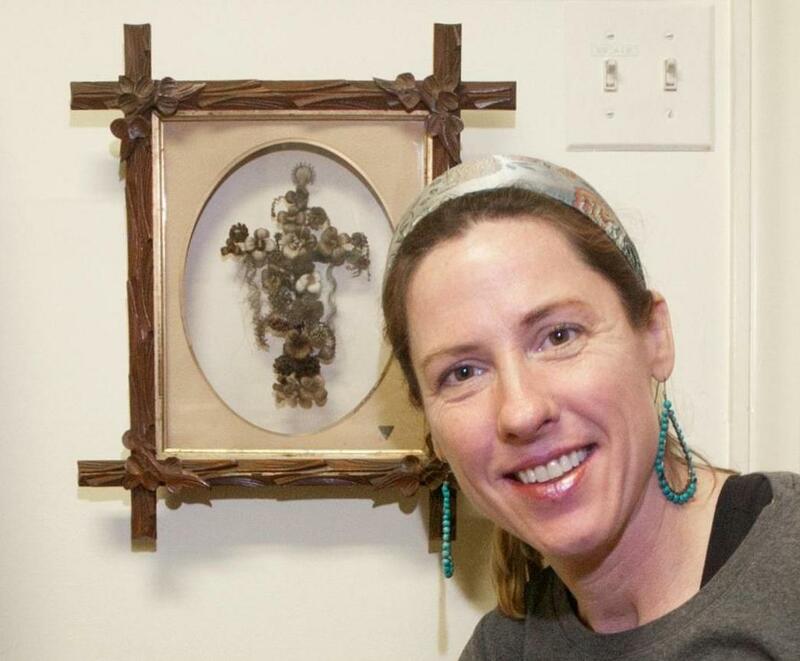 The hair cross was donated to the Historical Society by the grandson of James McKee. As part of our latest art exhibit “Warrenville Inspired,” this rare glimpse at Warrenville’s preeminent family was chosen by featured artist Rachel Weaver Rivera. Rachel was inspired by the use of the family member’s hair and created her own sculpture, “Primp Cross,” paying homage to the role that hair fashion plays in our modern world. “Making art prepares one in small ways to meet greater challenges with creativity. My studio practice involves playing with materials as a way to think, feel, and figure out how images and objects can represent and embody ideas. “Being an artist has taught me to put my faith in questions. My artworks contain elements of intuition, imagination, and permission to subvert the literal. Want to see learn more about Rachel? Check out her websites http://www.imagineartstudio.com and http://www.throughplay.com. Rachel’s work will also be featured in the West Chicago Banner Project starting in May and she is also collaborating to curate a show of young children’s artwork in celebration of The Week of the Young Child at the Frederick Graue House in Hinsdale, open to the public April 5th through the 28th. We hope you will stop by the Warrenville Historical Museum & Art Gallery Thursdays 4-7pm or Sundays 1-4pm to see the hair cross and the wonderful art inspired by our town’s history. Warrenville Inspired runs through Sunday, April 22nd. During the month of October we honor Illinois Archives Month. The purpose of Illinois Archives Month is to celebrate and promote the rich documentary heritage of Illinois by increasing public awareness of archival materials and repositories. 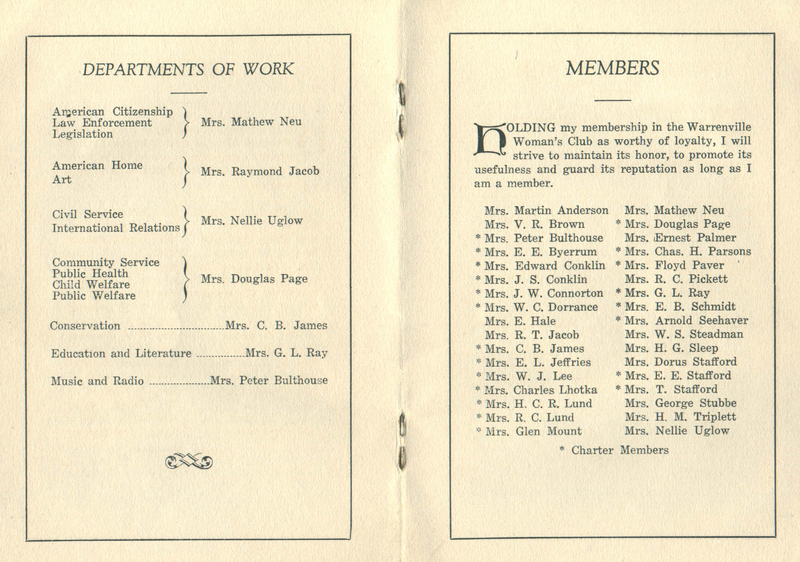 The state-wide program focuses on materials that have broad appeal to strengthen ties with regular archive users, as well as providing an engaging introduction to potential new users of archival repositories. To launch our new artifact of the month feature, we chose a photograph from our collection to showcase the history we are preserving in our our collection. 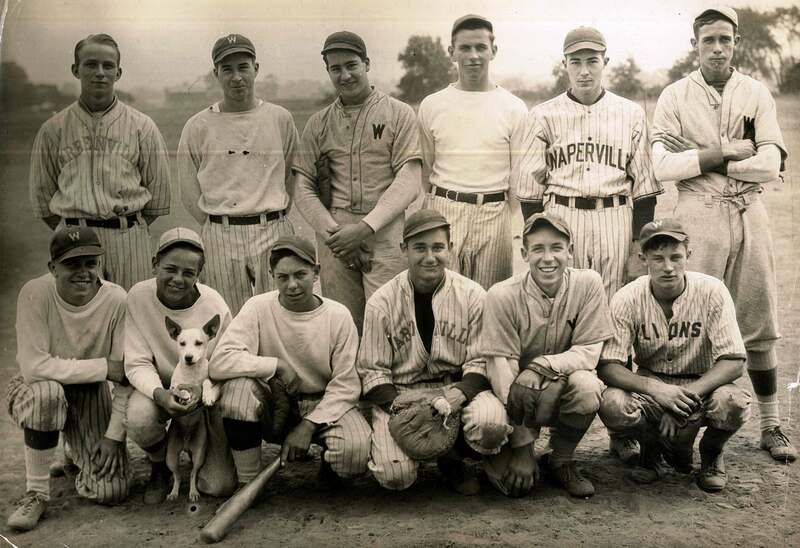 This photograph is of the Warrenville Cyclones in the early 1930s. Team members pictured from L to R: standing E. Brinkman, Vince Petit, Bud Petit, Jim Kuhn, Al Petit, Jim Sleep; kneeling: John Mount, Howdie Paver & Mascot, Harry Paver, Dilly Rogers, Joe Ray, Bud Rapp. The photo was taken on Calumet Avenue, known as Strauss Field, named after Chester Strauss one of the original Cyclones who was killed in an accident with the CA&E train in 1933. This photograph is one of the many treasurers in the Museum’s collection. 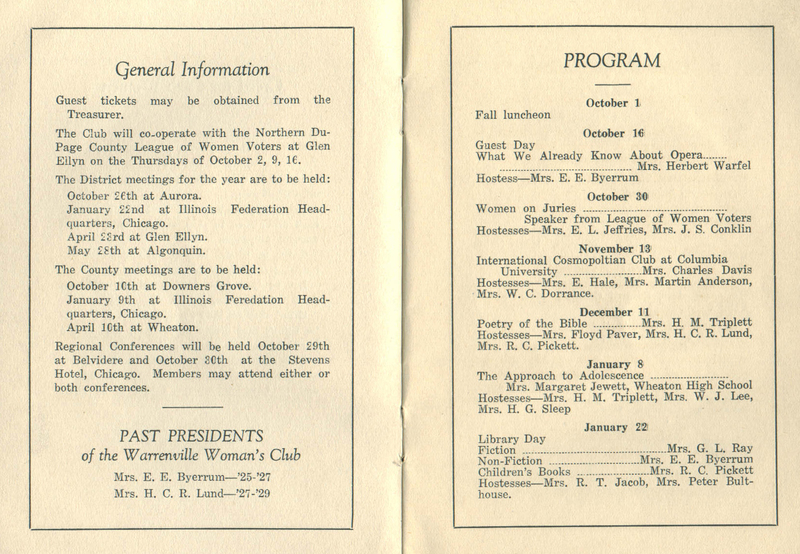 The Warrenville Historical Society’s collection includes historical documents and photographs like the one featured here. Our research library also includes WCHS Yearbooks from 1951-1977, Holmes School photo albums from 1966-1983, and Warrenville Digests from 1964-1995 and 2001-2004. 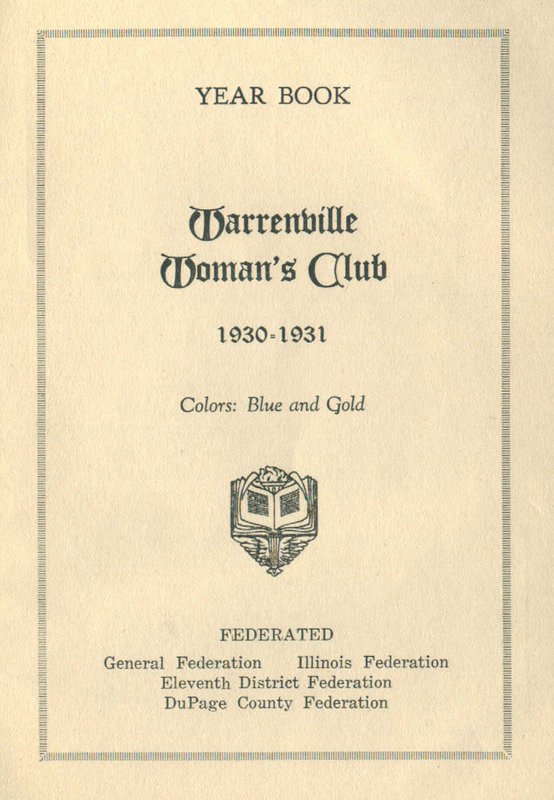 Researchers are invited to use these resources by making an appointment with our curator Sara Phalen, at (630)393-4215 or info@warrenvillehistorical.org.